Sometimes designed objects reject their users: a computer mouse that doesn’t work for left-handed people, for example, or a touchscreen payment system that only works for people who read English phrases, have 20/20 vision, and use a credit card. Something as simple as color choices can render a product unusable for millions. These mismatches are the building blocks of exclusion. 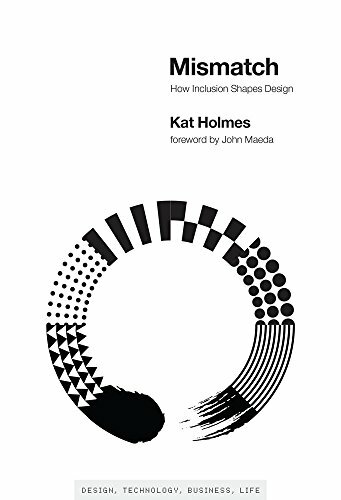 In Mismatch, Kat Holmes describes how design can lead to exclusion, and how design can also remedy exclusion. Inclusive design methods―designing objects with rather than for excluded users―can create elegant solutions that work well and benefit all. Holmes tells stories of pioneers of inclusive design, many of whom were drawn to work on inclusion because of their own experiences of exclusion. A gamer and designer who depends on voice recognition shows Holmes his “Wall of Exclusion,” which displays dozens of game controllers that require two hands to operate; an architect shares her firsthand knowledge of how design can fail communities, gleaned from growing up in Detroit’s housing projects; an astronomer who began to lose her eyesight adapts a technique called “sonification” so she can “listen” to the stars.